Sorry for the delay in posting, it’s been a pretty filled up week – really filled up and seeping out the cracks busy! This past weekend was a long weekend, so I travelled to the Hiroshima area. Saturday I spent the day in Hiroshima. We lingered around the A-bomb dome, went to Peace Memorial Park, and spent a few hours in the museum. I’m really not a museum person, but this one was incredibly interesting. I also don’t know a lot about history, so a lot of things I was reading about were all new information. It was an incredibly intense experience – really sad to see and think that the effects of the bomb that we dropped are still affecting victims today. I really can’t say a whole lot else about the day in Hiroshima, you’ll have to look at the pictures and check out my explanations there – it will give you a much better idea of what it’s like there. Pictures highly recommended! That night we ventured out to Saijo, a nearby city for Sake Matsuri, a huge annual sake festival. It had been going on since 11 in the morning, so when we got there, the train station was surrounded by staggering old drunk Japanese men! The festival was a good time, and I had the opportunity to meet some new people and see Paul, one of my coworkers from UMM info desk! Sunday we had a slow start in heading off to Miyajima to see the floating torii and shrine. The island is covered in deer that come right up to tourists – kinda crazy! The torii and shrine weren’t actually floating when we were there unfortunately, because the water only reaches that far during high tide early in the morning and in the evening. SO, I guess we’ll just have to go back some time when we have more time. :) We took a cable car up Mt. Misen to get a great view of the water and nearby small islands. We all agreed it was a place we’d like to return when we have more time. Maybe hike up and down the mountain next time. Oh yeah…at the top of the mountain there were monkeys just running around freely. So many animals! That night we headed out to Kasaoka to stay with Molly, another one of my former UMM info desk coworkers. What a Minnesota reunion it was this weekend! We went to her town’s festival, where the men carry huge portable shrines on their shoulders. They weigh over a ton, some up to a ton and a half! The men (no women allowed!) carry them around for hours around the streets of the city, singing and taking breaks for beer. At the end, they carry them up a steep stairway to the shrine. I can’t imagine how sore their bodies must be the next day! Molly’s fiancé Bobby joined in on carrying one of the floats and the group he was carrying with gave us their robe/shirts so we could be a part of the festivities. It was great! We were a little exhausted at this point from packing so much in the days before, but it was really fun to see. Monday was a holiday in Japan, Health and Sports Day, obviously worthy of missing a day of school for students and teachers alike. 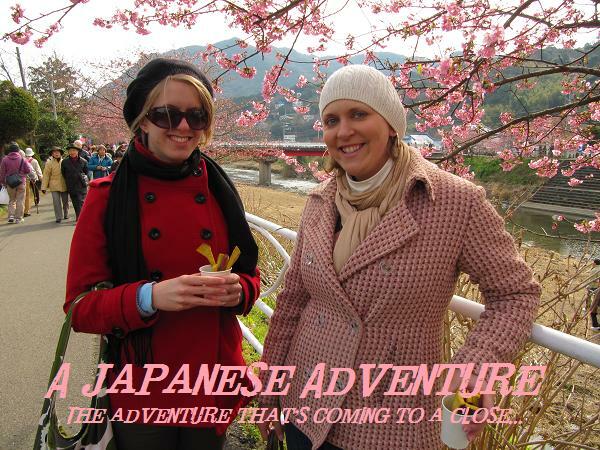 We headed off to Okayama with Molly to Korakuen, one of the top three gardens in Japan. It was amazingly relaxing and we saw a bride strolling in the park on her wedding day. Gorgeous! Our stroll in the park was followed by lunch at an organic restaurant with real wheat bread, salmon, cream cheese and tomato. Amazing closure to a great adventure! This week at school I don’t have classes because it’s midterms. The students left school at noon yesterday, and I’m not sure, they might do the same today. Since I don’t give midterm tests, they don’t keep me all that updated on what’s going on…but I guess tomorrow in the afternoon the whole school gets to go to the theater, so I get to see a play or something in the afternoon. We’ll hope there’s a lot to look at since I won’t understand a word of what they are saying haha. Should be interesting. Tuesday night I had my second adult conversation class which went really well. I feel like I kinda know where I am going with it now and understand what levels the students are at so that I can actually help them learn more English and practice with what they know! The people in the class are super fun, and I’m hoping to make some of them friends!